This video testimonial features Rick, a previous Davis Law Group, P.S. client who was injured in a motor vehicle accident while he was working as a limo driver in Seattle. The crash left Rick with serious foot and leg injuries, and he became frustrated with the lack of patience and courtesy he received when he called other law firms to discuss his case. Rick had previously ordered Mr. Davis's book, "The Ten Biggest Mistakes That Can Wreck Your Washington Accident Case," and found the book to be 'really informative.' He called Davis Law Group to discuss his case, and after receiving a significant amount of compensation for his injuries was able to move on with his life. It was October 21 and I was working for a limonene company, owned by one of my very best friends, and basically I was driving the GMC Yukon Denali heading northbound on West Marginal Way when some lady just missed the turn and hit me head on. The injuries I sustained were pretty much to my right foot. It shattered by heel bone because I was trying to get on my break but I didn’t get there before the impact happened, and pretty much just smashed my foot into the brake pedal and everything else in-between. You know, I listen to KOMO and of course I have heard of Chris’s advertisements and I said, well you know what, I wanted to get that anyways because I was in an industry where that could very well most likely happen and sure enough it happened to me. 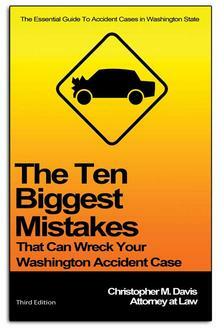 Yeah I requested the book, “The Ten Biggest Mistakes That Can Wreck Your Washington Accident Case.” It was the guidebook or it was the manual, per se, on how to deal with an accident. I called Chris just because he was the author and the book was really informative. I did call a few other companies as well. They were either too short with me or they just didn’t have any patience with me. A couple people didn’t even call me back. And I was like, you know I don’t really have time to play around with this kind of stuff. I called Chris and Mischelle came out within two to three days and sat down in my house and answered every question I ever had.